I'm new to the Biocompare product directory. Where do I start? To get started with Biocompare, it is best to arrange a call to speak with a member of our Biocompare Product Listings Team. Together, we can talk through the guidelines, timelines, search algorithm, and how to make sure that your file can be processed as quickly as possible. A good person to include on this call is the member(s) of your team who is hands on with your product data and product data extraction (depending on your organization, this is sometimes a technical marketer, and/or database administrator). 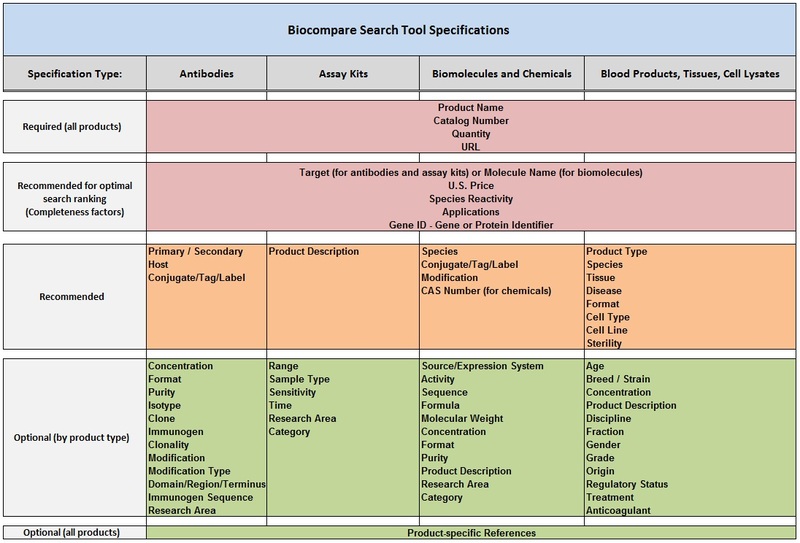 Please also view or download a copy of our current product listing process overview document for non-equipment products at biocompare.com/guidelines. Click here to view the product listing process. Click here for more information on our search algorithm. Click here to access the current Product Listing Guidelines. Click here to for tips on how to speed up your file processing time. Click here for the permanent link to this question. Product Compression is a significant upgrade to the search experience on Biocompare. This upgrade allows scientists to quickly access a greater variety of companies in search results, and it guarantees that more of our partnering companies are surfaced on the first page of search results on Biocompare. This greatly benefits both our audience and our product directory partners. Scientists can click to expand to see the full selection of products from any one company. The image below shows a sample of two companies appearing in search results, each with two listings showing. There are “See More” and “View All” links that will allow the scientist to either view a fixed, limited additional listings from the company, or to view all of the offerings from one company that are relevant to the search term. At this time, we do not have a mechanism by which our partners can choose which two products show in the search results. As we adopt Product Compression and further refine the search experience on Biocompare, it would be useful for us to know your thoughts on the best possible criteria by which to rank search results. You can send your ideas and feedback to Products@Biocompare.com. Click here for more information on submitting product images. Click here to see all the information about improving results. Coming Soon: Click here for more information on product reviews. How do I specify or update the calls to action for my products? Get Quote: This is our standard lead generation action. To use this action, you do not need to specify the action in your submission file. Your equipment products will be assigned this action by default. Request Info, Request Demo, and Request Sample: To use any of these three lead generation actions, please include a column in your submission file that specifies the desired action per product. Supplier Page:This is our standard clickthrough action. To use this action, please include a URL column that specifies the product page URL on your website that users will be directed to when clicking on Supplier Page from Biocompare. Supplier Page URLs should be product-specific pages where an end user can learn more about the product. Company home page URLs are not advised and should only be used as a last resort. View Protocol: This is an alternative clickthrough action that can be used in addition to Supplier Page. To use this action, please include the protocol URL in a separate column. View Protocol URLs should be a web page where the end-user can directly read or access the product-specific protocol. PDF links are discouraged. What calls to action can my products have? A maximum of three actions per product are allowed. The primary action is always a button and any additional actions are text links. Can you send me a template to fill out? If you have a database of your product data, and you are able to obtain consistent extracts of that data, it is probably much easier and faster for you to work with your database extracts than it would be for you to fill out our template(s). If you do not have a product database, or you are not able to access extracts of your data, then template(s) may be the best way for you to submit your data. Note: We no longer offer a "general" template; we will provide a different template for each product type. To download your template(s), click on the link(s) below that correspond to the product types that you are listing on Biocompare. Note: If these links do not work for you (for example, if pop-ups are blocked in your browser, or for other security reasons) please email us at products@biocompare.com to request template(s). Once you start using templates, or if you switch to templates, please continue to maintain the same template file for your data submissions. Please populate the template using the allowed values and by following the examples noted in the instructions in the second tab of the template. Please leave recommended and optional cells blank when there is no data to fill in. Please do not use filler entries such as: "Other", "Inquire", "Please call", general scientific information, or other non-data or incorrect data entries. Filler entries may result in delays, or return of the file to you for clean-up. How is my product data reviewed before upload? Each time a file is submitted, we conduct a thorough review of your product data including: File structure, specifications, data quality and formatting. If we come across significant issues, we will be in touch with you to dialogue towards the best solution. 1. Establish the file type and what is being updated: Is this an update of all the products or just the prices or URL's? Is this a list of products to add, or the entier listing? 2. Check for file consistency: Have the column headers changed? Are the products uniquely identified in the same way as they were in the last file? 3. Check to make sure columns are not duplicated. 4. Check a few catalog numbers to make sure they have not changed. 4. Make sure categorization or product type is present. 1. Check to make sure antibody product names meet our guidelines (i.e. target is not repeated and the item name is not the target). 2. Check to make sure that the file contains concise, data-only entries as much as possible. Example fields to check: Applications, Species Reactivity, Species, Target, Molecule. 3. Check References to make sure they are comma separated PubMed or PubMedCentral ID's. 1. Check for non-english characters (note: Files with non-english characters will be returned for corrections). 2. Check HTML tags for anything beyond basic formatting tags – bold, italics, underline, lists, superscript, etc. are OK.
How long will it take to get my products up on Biocompare? The listing process takes up to four weeks depending on the number of products and if the submission file meets Biocompare’s Product Listing Guidelines. What is the product listing process? Submit your product data file in accordance with our data guidelines. We’ll review the file and provide feedback, if necessary. Once approved, we programmatically map the data to our specifications. The data is uploaded to the database. The product listings are live on Biocompare for your review. If you are new to Biocompare, it is best to arrange a call to speak with a member of our Biocompare Product Listings Team. Together, we can talk through the guidelines, timelines, search algorithm, and how to make sure that your file can be processed as quickly as possible. A good person to include on this call is the member(s) of your team who is hands on with your product data and product data extraction (depending on your organization, this is sometimes a technical marketer, and/or database administrator). Please view or download a copy of our current product listing process overview document for non-equipment products at biocompare.com/guidelines. What are the standardized application values that are used on Biocompare? Below is a list of many of the standardized application values for Antibodies that are used on Biocompare, along with the abbreviation. This list is not exhaustive and we accept all applications for which your products have been validated. Please only include validated applications with no other text in the column and separate multiple applications with a comma (e.g. PCR, Cloning). Common abbreviations are acceptable. Are we missing an application? Email us at Products@Biocompare.com with details. Assay Kit: Assay kits should be kits designed specifically for measuring or detecting an analyte. Bundles of chemicals, reagents, or biomolecules should be categorized accordingly. Biomolecule: An item that has a gene, target, peptide or protein is considered a Biomolecule. This item can be a standalone item or come in a kit configuration. Single nucleotides are considered chemicals and not biomolecules. Inhibitors will be cross posted into the Chemicals and Reagents category. Examples of biomolecules are: Proteins, peptides, enzymes, histones, carbohydrates and anything with a biological source. Equipment: Should be true, stand alone equipment and not accessories such as power supplies. Any durable item of value that is not disposable, except for single use bioreactors, is equipment. Equipment Accessories: Examples are power supplies. Our working definition of an accessory is anything that you cannot plug into 1) a power supply, 2) a gas supply or 3) a vacuum hose and immediately put to use. If anything needs to be purchased in order for the item to work, it is an accessory. Supplies & Consumables: Should be tubes, plates, slides, and ancillary items. Examples: Magnets, RNA gels, agarose IEF plates, etc. Blood & Tissue Products: Anything that is dead and is disease related should be placed in this category. Examples would be: Saliva, skin, serums, urine, feces, blood plasma, tissue and cell lysates, cell line specific lysates, and tissues that are preserved in blocks, powders or slides. Why do you need a separate column with Target? It can be difficult to cleanly derive or extract the Target information from another field (e.g. Product Name) so we request that you supply it in a separate column. It is important to only include the target molecule without any species or other information. For example, CD133 is an acceptable target but Mouse CD133 is not acceptable. Important Note: The Target field is considered as a completeness factor by our search algorithm. Fielding Target separately may improve your search results. Click here to learn more about our search algorithm. What are your current product listings guidelines? Click to view or download a copy of our current product listing guidelines for antibodies, assay kits, blood and tissue products, as well as general guidelines for all product listings. Alternately, they will always be available at biocompare.com/guidelines. We will be updating and adding to this document, but you will always find the latest version here. How are Greek symbols handled on Biocompare? When our data parsing system encounters a Greek symbol in your data file, it automatically converts the symbol into html so that the symbol will render correctly on Biocompare (for example, the symbol ß in your file becomes the HTML mark-up for that symbol (β) in our database, which will correctly show the symbol, as intended, online). It should be noted that symbols are not commonly entered into our search box, nor are they searchable on Biocompare. You can use symbols in your product names, however recommend that you also use the spelled out version (e.g., "beta") in your product names, so that your products will be searchable by the spelled out version of the Greek symbol. Where can I find Gene IDs for my products? There are numerous ways to obtain gene IDs for gene-based products. The most accurate methods require some sort of ID - whether it's from an Affymetrix chip or a protein PDB ID, but having only a species and gene symbol, or in some cases just the gene name itself, can be enough to obtain a gene ID. The BioCompare product database uses Entrez GeneIDs to pull in various curated data, including species, full NCBI gene names and synonyms, so it is best to obtain the Entrez GeneID when possible. However, we are able to convert gene IDs from various sources to Entrez GeneIDs, so just about any ID-format is acceptable. NCBI Gene - searches any provided ID, symbol or gene name across many databases. Strengths: ID conversion and free text lookup of gene names. Initial ID format can be specified but is not necessary. Weakness: Output in "gene card" format; Limited to single lookups (multiple lookups not allowed). Strengths: Multiple lookups allowed by pasting or file uploads. Weaknesses: Starting ID format is required. Strengths (over SwissProt/UniProt): More programmatic tools allowing increased user control over mapping. Weaknesses: ID formats are organized only alphabetically, not by database family as by SwissProt/UniProt. Additional ID conversion websites can be found. Many of these have the ability for local installations of their databases or other programmatic interfaces simplifying the task of converting hundreds or thousands of IDs. How are search terms handled by your search engine? As you put together your data for our directory, it may be useful for you to understand how search terms are handled by our system. This way, you will know when to expect to see your products show up for searches, and why. Gene ID’s are used to populate the NCBI Full Gene Name, and NCBI Gene Alias fields with additional standard target values that are searchable and visible in the product directory (product details page). Gene ID’s are also used to augment searchable - but not visible - standardized database entries for Gene Symbol, Species Reactivity, and Target. Supply a Gene ID, Accession Number, or SwissProt ID for all applicable products. Pick the most common, targeted version of your desired antibody target and use that iteration to name your product and as the target in your data set. For example, use Nav1.1 in the antibody name and as the target; Nav1.1 is more commonly used than Nav 1.1 (with a space) and more targeted than just Nav. How can I get my products to rank higher in the search results? Can I list different prices for different countries or geographical regions? Yes, country and/or region specific pricing can be listed. Please include the currencies in separate columns in your submission file. Also, if it is not obvious, please provide a list of the countries in which each currency should display. How do I know that all of the clicks are legitimate? How can my trial size antibodies show up when the trial size filter is selected? In order for antibodies to appear when the trial size filter is selected, please include the term “trial size” in either the Product Name or the Quantity field. Alternatively, you can add a separate column in your file specifying which products are trial size, however, please let us know you are using a separate column so we know where to look for that information. How can I add my products to certain categories? Our new, automated category creation system, alongside our content team, determines product categorization. Additionally, we do consider all specific categorization requests. Please email the Product Listing Team (products@biocompare.com) the links to the specific categories in which your products should be listed. Our content team will review your request and notify you accordingly. Can I add known publication references to our product listings? Please provide the PubMed ID, PubMed Central ID, or DOI and we will acquire the citation. Free-form citations are not accepted. In the main product file or in a separate file, include catalog number in one column and all of the corresponding IDs in a second column separated by a semicolon and a space (e.g. 123456; 67892). Multiple citations per product are supported. Note: General references to related products like genes, proteins, technology or scientific concepts will be omitted. How long will my product data update take? Product data updates can take up to four weeks depending on the number of products, the scope of the update, and if the update file meets Biocompare’s Product Listing Guidelines. How can I update just the prices for our product listings? If you use unique catalog numbers, prices can be updated by submitting a spreadsheet with the catalog number in one column and the corresponding prices in another column. If you do not use unique catalog numbers (e.g. products with multiple pack sizes that use the same catalog number), please inquire with the product listing team on the best way to update product price. We will need to look up what the tiebreaker is for your products, which is the combination of specifications we use to uniquely identify your products in our database. How can I update just the URLs for our product listings? If you use unique catalog numbers, URLs can be updated by submitting a spreadsheet with the catalog number in one column and the corresponding URL in another column. If you do not use unique catalog numbers (e.g. products with multiple pack sizes that use the same catalog number), please inquire with the product listing team on the best way to update product price. We will need to look up what the tiebreaker is for your products, which is the combination of specifications we use to uniquely identify your products in our database. Can I add images to my product listings? Yes, at this time we can upload one image per product. Our users want to see images of your products and we welcome the opportunity to help you with that. Please submit your images per the directions below. We will reformat your images as JPEGs to the following standards: 52w × 39h, 400w × 300h, 1600w × 1200h1. To minimize processing and potential degradation to your images' quality, please submit your images in the 4:3 aspect ratio at a minimum of 400w × 300h. Please submit a spreadsheet with two columns: catalog number, and a publicly accessible URL for the image. You may also provide a column for the image URLs in your regular product updates. Our system will download each image, and reformat as needed to our standards listed above. Your images will be queued in our system for download, formatting, and uploading to our site. Please allow one to month (or more for extremely large numbers of updates). We will prioritize products that do not currently have an image. We understand that images are a key component of antibody appplication validation, and we have been hearing more feedback and requests for enabling more than one image per listing, and for showing images in search results. We are definitely hearing and considering this feedback. As a first step, we would like to see more listings populated with one image as a starting point - please send us yours. 1 1600×1200 is a new image size. We are attempting to collect a library of high resolution images for future use on our web sites. At this time, these images are not in use on the site. 1600×1200 format images will be created and saved only if the source image is of adequate resolution and quality. How can I speed up the process of updating our product data? Our content engineering team writes a unique program that is customized to your data. Part of what this program does is map your columns to our existing specifications. When you change your file significantly, the team has to go back and update or re-write your program. This can cause delays. Write a quick note with your file submission to let us know what changes to expect. Did you change your column headers? Add a column with Gene ID's? Delete 2,000 products? Add 4,000 products? Are you writing over old catalog numbers with new data? Knowing what to expect with your file will tell us exactly what to look for during upload and QA. This will both speed up our QA process and insure that the changes you intended are reflected on the site. For example, if you are still providing the antibody target as part of the product name (and not as a separate column), then delays can be expected. Not only is there extra programming involved, but often times we need to resort to manual efforts to extract each target. How do I update the company logo? Please send us your new logo (.jpg, .gif, or .png) formatted to 400w x 300h pixels. What can I do to improve my product data on Biocompare? We've created the checklist below to so that checking your data for key specifications and quality issues is easy to do. Covering the key specifications and quality components in your listings will assure that you are maximizing the contribution of your product data to your overall results on Biocompare. Required specifications are needed to create basic entries in our product directory. Specifications that are recommended for optimal search ranking are observed by our search engine as completeness factors; including these specifications will optimize your ranking in our search results. Recommended specifications will help our users to compare products and to choose the products that best fit their needs. Optional specifications further define your specialized products as needed. Notes: Specifications that are not found on these lists will not be accepted in our database. Additional Search Tool Specifications will be added as they become available. For descriptions of each specification, please see the listing guidelines. Make sure you have included separate spreadsheets or columns to indicate categorization or product type. Click here to learn more about how to categorize your products. 2. Check to make sure that the file contains concise, data-only entries as much as possible. Example fields to check: Applications, Species Reactivity, Species, Target or Molecule. Submitting concise data will maximize your product listings in Biocompare search results. Completeness of the data based on select specifications. As you explore your product listings within the Biocompare website, it may be useful for you to understand how search terms are handled by our system. This way, you will know when to expect to see your products show up for searches, and why. Also, below we have included some tips for maximizing your listings exposure on Biocompare. Can you send me an example of the "perfect" antibody listing? Please also provide a link (URL) for each product that links to the product page on your website for that item. Reviews and images are not part of our search algorithm, however, they can help to differentiate your product and drive clicks once your product is being viewed.